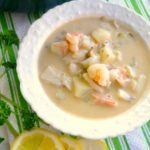 A recipe for classic creamy seafood chowder that adds an interesting south-of-the-border taste with green chilies, paprika, and a splash of lemon juice. Melt butter over medium heat and add the potatoes, onions, and chilies. Stir and cook for 3-4 minutes until onion is softened. Add paprika and flour, stirring well, and cook for 1 more minute. Add the water and the juice from the canned clams to the pot along with the salt and pepper. Bring to a boil, then reduce heat and simmer about 15 minutes or until the potatoes are tender. Stir in half-and-half, milk, white fish, and shrimp. Cook over medium heat until the fish is cooked through, about 5 minutes, stirring occasionally. Finish the chowder by stirring in the juice of the lemon and adjust salt to taste. Sprinkle with chopped parsley and serve. *Russet potatoes work best for chowders. **Mild green chilies like Anaheim or Ancho are best. You can substitute a chopped jalapeno pepper for some of the chilies if you’d like your chowder spicier.